I for one am very sad that it's Monday and the weekend is over. Don't they always fly by way too fast? This weekend D.C. got hit with a bit of a snowstorm. The weathermen were all saying we were only supposed to get a dusting to an inch. Surprise, surprise, we got about six. But the baked potato soup was so worth it. I highly recommend it if you're in the mood for some warm comfort food. The bread bowl is a must! After dinner we walked over to Border's, scored some sweet $2 books in the sale boxes and then go some coffee and tea. Coffee for the BF, tea for me. 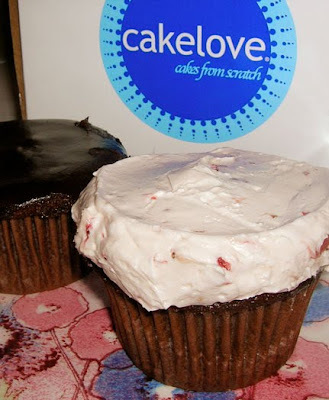 And on the way home, we stopped at Cake Love for some delicious cupcakes. So despite the fact that it was freezing cold and slippery outside, good food somehow managed to make it all better and getting out of the house was so worth it. What a great way to spend a cold day! Nice! CakeLove, be still my heart. I maintain that it's the best cupcakes in the city. we got nailed by that snowstorm too. that soup would have been nice. 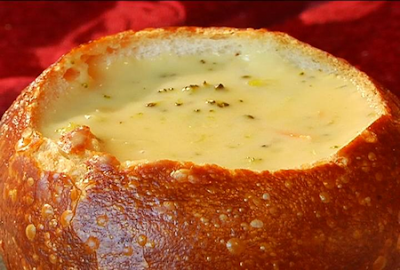 mmmmm, potato soup in a bread bowl......the picture alone has warmed me up inside! I had black bean soup in a bread bowl this weekend....so good!! Mmmmmm...now I want soup and cupcakes! I love bread bowls! Definitely a comfort food!! YUMMMMMMM! That soup looked wonderful! That soup looks tasty! Yum!